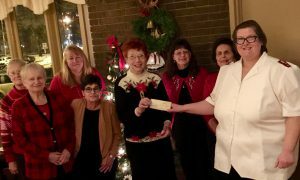 FULTON – The Women of Rotary in Fulton recently presented a check to Captain Heather Odom of the Oswego County Salvation Army as a contribution to the current Christmas kettle campaign. Shown with Salvation Army Captain Heather Odom at the recent presentation of a check to the Christmas kettle campaign, are some of the women of Rotary in Fulton, including Mary Ann Langlots, Connie Standard, Rita Chiretto, Leanne Gillen, Megan Gillen, Pauline Rasbeck, Martha Becker, Mary Jolce and Sharon Lancaster. The money will be used all year to provide services to people in need throughout the county for such things as groceries, hot meals, clothing, household necessities, rent, and other emergency assistance. Captain Odom also announced that Christmas Day dinner will be served at the Center for Worship and Service, 73 W. Second St., Oswego, from 11:30 a.m. to 12:30 p.m. Anyone who will be alone or unable to have a special Christmas dinner is cordially invited to attend. She also offered her sincere thanks to everyone that has made gifts to the familiar kettles, or mail appeals, or online at https://donate.salvationarmyusa.org.